What are you thankful for this year? I've been trying to give this a lot of thought, assuming I'd have a killer post to write about it. Despite all of the privileges we may enjoy in life - a place to live, food to eat, Internet access - it's hard to comprehend all of the things we have to begin with, let alone which of them we appreciate most. 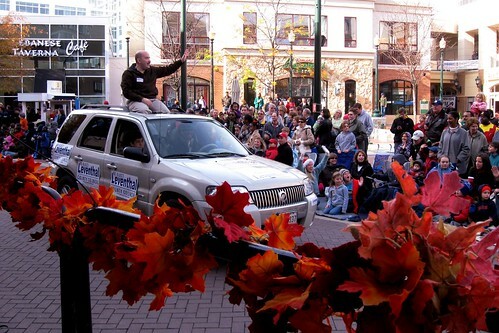 I was in last Saturday's Montgomery County Thanksgiving Parade, driving the official Councilmember Leventhal SUV Big Important Float, blasting Bruce Springsteen ("Nothing says 'America!' like Springsteen," George noted) and having a great time despite how corny the whole thing felt. It's not cool at a young age to be happy or thankful and far, far easier to be irritated about someone or something because the pain - no matter how trivial - makes you feel like you've had something to struggle for. But I could feel the smile forming on my face as I drove down Georgia Avenue, surrounded by the small army of local kids the campaign had rounded up to walk alongside the car and, beyond that, the tens of thousands of people who'd come out to watch the parade, waving at George. At Georgia and Bonifant I noticed someone waving at me and mouthing something. All I could hear was Bruce singing about Asbury Park, so I turned it down. "That's a great blog you write!" he yelled. Whoa. I don't know who you are, but you made my day. So that's something I'm really thankful for this year. It's cool to see something you do behind a computer screen yield something in real life - in a parade, no less. Another thing I'm thankful for is this photo from the parade, taken by East Silver Spring resident and friend of JUTP Kathy Jentz. I didn't feel safe wielding my camera from inside the car as I did during the Burtonsville Day Parade (there were actually people in this one), so it's all I have. But if that's not enough, check out these awesome photos from Flickr user Scattered. And have a happy Thanksgiving! Hopefully you're not reading this and are actually with people who love you.